Ultra Compact Surfaces are a new type of countertop surface manufactured by putting the raw materials found in glass, porcelain, and quartz, under extremely high heat and pressure to create a nearly indestructible material that can be used for countertops, floors, sinks, and even interior and exterior wall cladding. NeoLith is the next step in the evolution of counter top surfaces, flooring and wall cladding. NeoLith is a breakthrough, high-tech ultra compact slab that makes the most demanding architectural projects easy, offering the ultimate combination of functionality and beauty for interiors, exteriors, and furnishings. NeoLith claims is the most durable countertop product on the market and can be used indoors or outdoors without worry. Even if you are planning to install in a location where temperatures vary from over 100° Fahrenheit in summer to -40° below zero in winter, NeoLith can handle extreme the exposure without worry. 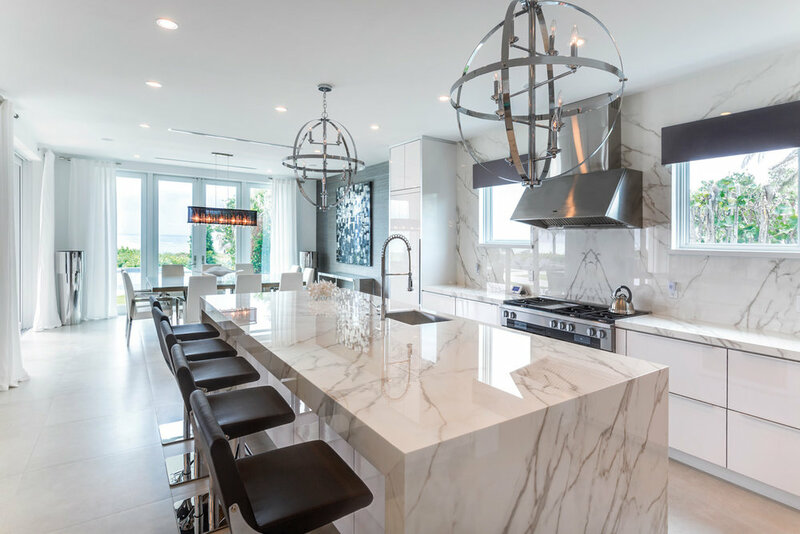 What makes NeoLith the best choice for your new countertops? Its NeoLith’s revolutionary manufacturing process that uses 100% natural materials, extreme heat, and intense pressure to produce the most durable surface material available in the market today. Neolith is an easy-to-clean material as it does not absorb residue or food remains, thereby guaranteeing good hygiene. It is also resistant to most chemical agents used in cleaning, although a damp cloth is sufficient in most cases for cleaning it. NeoLith recommends the use of 12 and 20 mm thick slabs for countertops. These thicknesses make it possible to create several types of edging that match different design styles. NeoLith recommends a radius of at least 2 mm. The greater the radius, the better it will bear any impacts, but there will also be more base color in the slab. In areas with a high risk of impact (sinks, for example), a 2 mm radius edging is recommended as this is the best option for the look and durability.TheSize offers a 10-year warranty on its NeoLith slabs in the following thicknesses: 3+3+3, 3+3, 5+3, 6+3, 5+5, 10, 12 and 20 mm in the Satin, Silk, Polished and Riverwashed finishes used for kitchen countertops.